Usually I skip these polyketide syntheses but this one caught my eye. I really like these rapid assemblies, like those from the Krische group, of contiguous stereocenters without many “old-school” operations (e.g. Evans-Aldol). And as mentioned in the title the authors refer to this, in my eyes awesome, paper from Baran et al. on how total synthesis becomes more ideal. 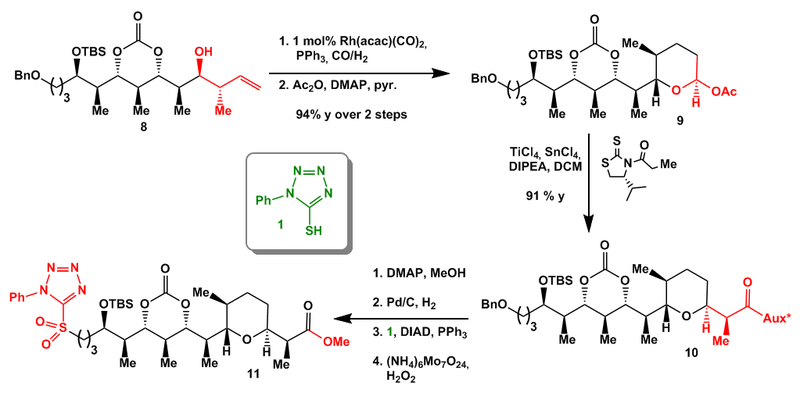 The synthesis of the first fragment starts with a Shi epoxidation of known olefin 1 which sets the critical stereocenter. 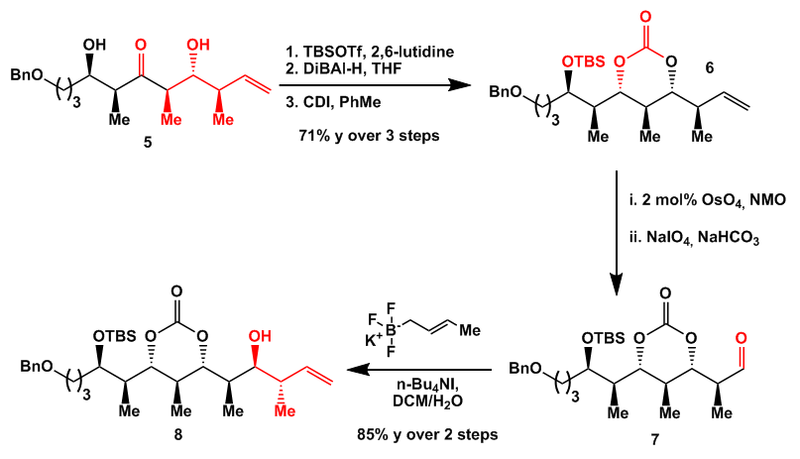 Regioselective epoxide opening with in situ formed propynyl aluminate and some help from BF3-etherate formed alcohol 3 which was silylated to give 4. The resulting silane was used to form at least three more stereocenters and after Tamao-Fleming oxidation ketone 5. Compared to the rules from Baran et al., this starting point is 100% ideal because every stereocenter formed derived from a bond-forming step. 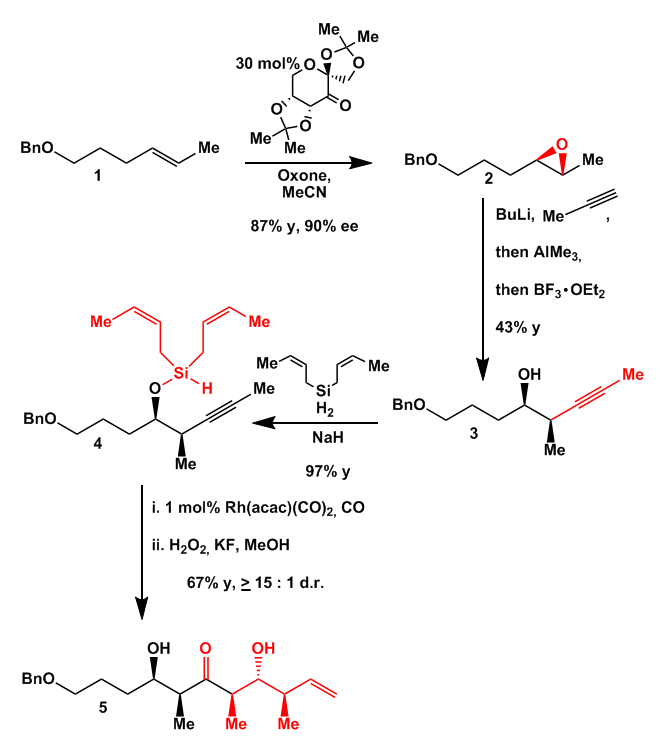 The cool Rhodium promoted rearrangement will be examined at the end of the synthesis. 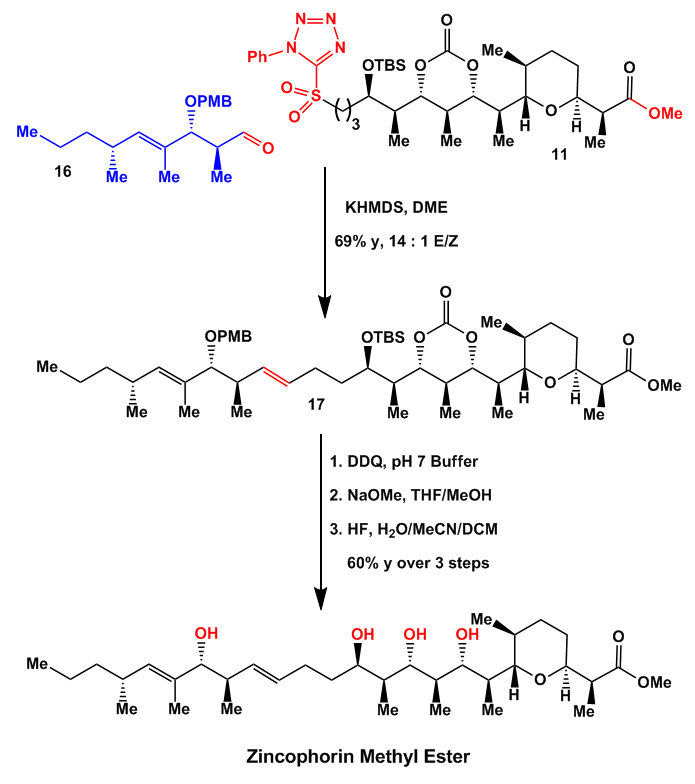 Next ketone 5 was protected, reduced and the resulting diol protected again as the cyclic carbonate 6. 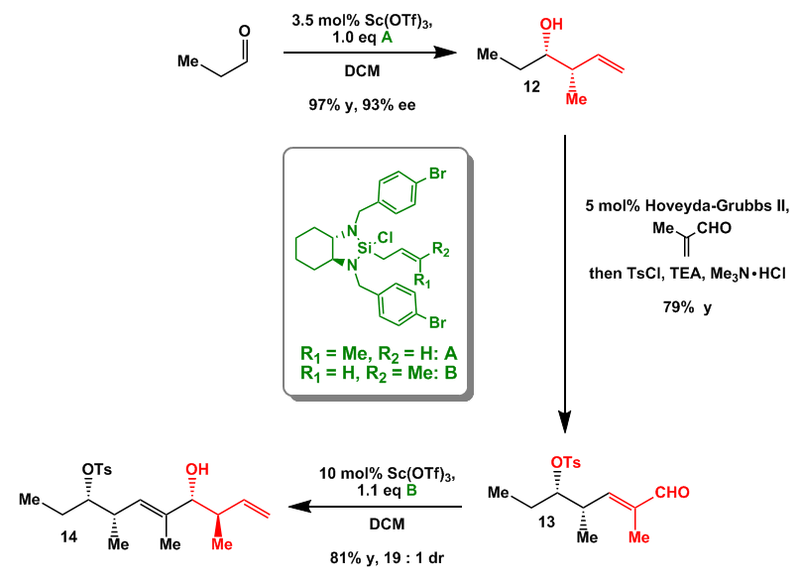 Oxidative cleavage of the terminal olefin furnished aldehyde 7 which underwent stereoselective crotylation to give homoallyl alcohol 8. Going on with the synthesis the newly formed terminal olefin was used to form again under Rhodium catalysis a tetrahydropyran ring. The free alcohol was acetylated to give 9 and reacted with the Nagao-Auxiliary shown under combined titanium and tin catalysis to give 10. Methanolysis of the amide bond, debenzylation, Mitsunobu reaction with 1, and oxidation of the sulphide formed key fragment 11. The second half of Zincophorin also features a very nice crotylation reaction which set the first two stereocenters. Reaction of propionaldehyde with A in the presence of Sc(OTf)3 formed 12 which under a CM-reaction and tosylation gave 13. Another crotylation, this time catalysed by a bit more Sc(OTf)3 and silane B gave olefin 14. This cool crotylation will also be examined at the end of the story. Alcohol 14 was protected as the PMB-ether and the unnecessary tosylated hydroxy functionality reductively removed. Oxidative cleavage of the terminal olefin gave at last fragment 16. Both halves were combined through a highly selective Julia-Kocienski olefination to give 17. 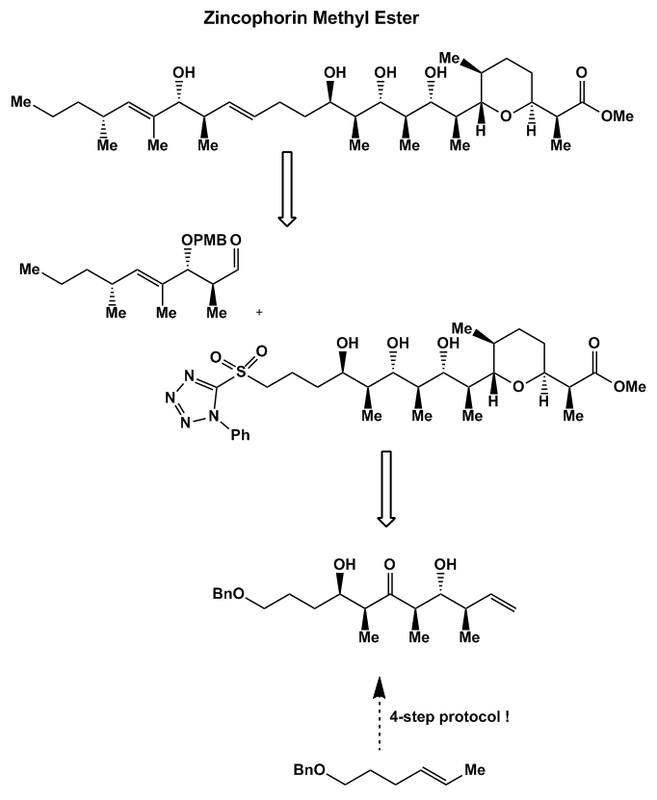 Global deprotection was started with PMB-group removal, followed by dioxanone cleavage and desilylation to give Zincophorin methyl ester. 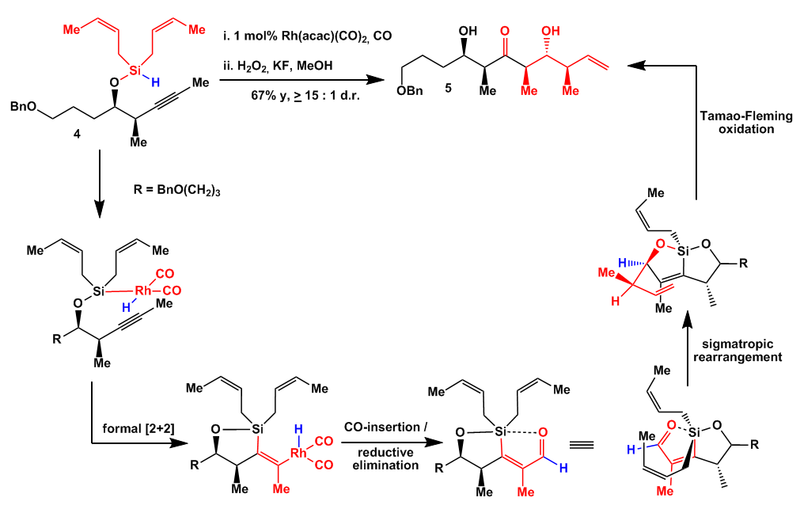 So at last as promised is the mechanistical background of the first Rhodium catalysed C-C-bond forming step. An older paper (JACS, 2000, 122, 8587-8588) gave some hints on how this chemistry works. If you disagree with my thoughts I would be very interested in your solution. The first step should be an oxidative insertion reaction of Rhodium into the Si-H-bond. Next a metallosilylation reaction might proceed (a formal [2+2]-addition reaction) followed by a CO-insertion and reductive elimination of Rhodium to give the aldehyde shown. The homoallylic silane underwent a sigmatropic rearrangement which results in allylation of the aldehyde. Tamao-Fleming oxidation of the vinyl silane then produced an enol which tautomerized stereoselectively to ketone 5. Nice… this is a really impressive protocol. The other crotylation strategy is discussed in detail in this paper (JACS, 2011, 133, 6517–6520). 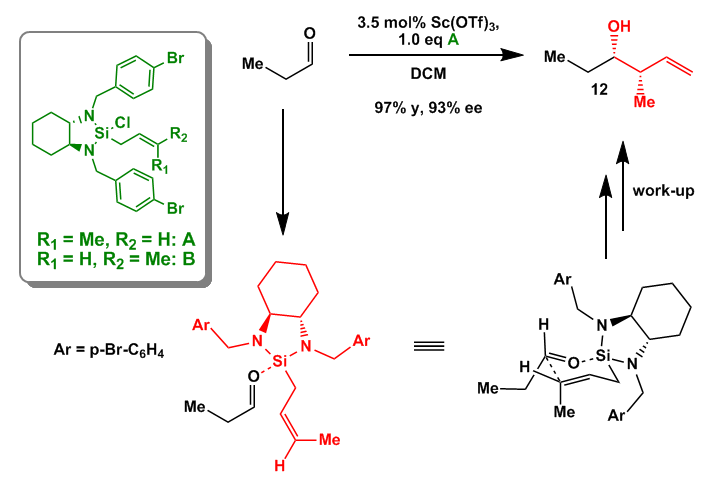 It starts with a silylation of the aldehyde and sigmatropic rearrangement through a chair-like transition state (Zimmerman-Traxler transition state) to give 12. So that is it for the moment. Hope you enjoyed reading this and the cited literature as I did. And as usual big thanks to Bobby for proofreading!